Even with the SPX rising on Friday, the VIX managed to close up a bit. The VIX will typically trade in a direction opposite the SPX, so it is unusual that they both close higher. On Fridays, the VIX has a natural tendency to dip in the afternoon, so it is most unusual to see them both close higher on Friday. 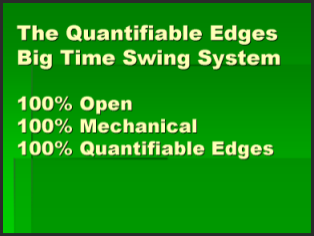 In the 12/3/12 blog I showed a stats table that suggested a decent downside edge based on this action. 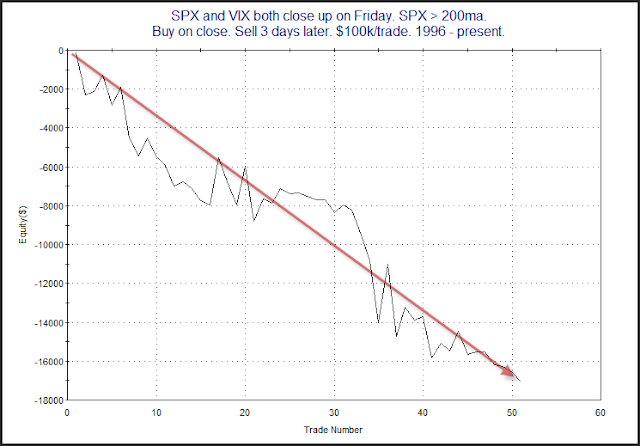 It examined instances of the VIX and SPX both closing higher on a Friday while the SPX is in an uptrending market. Rather than update those odds with just the 1 extra instance, I have provided below a picture of a profit curve. I don’t often show profit curves on the blog, but almost always share them in the Subscriber Letter. Considering the fact that the study utilizes a long-term uptrend filter, the persistent downslope is quite impressive. The last instance once again put the equity curve at new lows. Heads-Up Investing pointed out this study and a few others on his blog over the weekend. Traders should keep in mind that the above study represents just one bit of influence that could impact the market over the next few days. There are always crosswinds. And while the weight of the evidence that I am seeing is pointing towards a short-term dip, strong momentum and liquidity could continue to push the market higher.